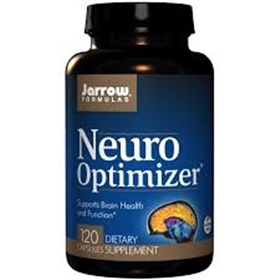 Neuro-Optimizer is nutrition for the brain, combining CDP Choline (cytidine 5’-diphosphocholine, also known as Citicoline), Phosphatidylserine, Alpha Lipoic Acid, Acetyl L-Carnitine, L-Glutamine and Taurine to enhance brain metabolism and antioxidant protection safely and naturally, but without the use of stimulants. Citicoline (CDP-Choline) is an essential intermediate in the synthesis of phosphatidylcholine, a major constituent of the gray matter of brain tissue (30%). Citicoline promotes brain metabolism by enhancing the synthesis of acetylcholine and restoring phospholipid content in the brain. PS (Phosphatidylserine) supports the brain’s proper response to stress and promotes neuronal communication. The antioxidants Acetyl L-Carnitine, Alpha Lipoic Acid and Taurine provide protection for the neurons from damage caused by certain free radicals. Acetyl L-Carnitine, Alpha Lipoic Acid and L-Glutamine also support energy utilization. Taurine also aids in osmoregulation (maintenance of proper concentrations of ions) inside the cell. Take 4 capsules per day with juice or water between meals or as directed by your qualified health care consultant.